Bubbles and nibbles heralded the launch of a new community event for Eccleshall residents and businesspeople. The Eccleshall Network’s first gathering was held at The Artisan this month. The group, known as Ten, aims each meeting to support and connect the community, inform people about a key topic and encourage charitable donation to one of the town’s good causes. The inaugural event saw Robert Fearnley from local solicitors Bowcock and Pursaill explain about the importance of Lasting Powers and Attorney. Then it was the turn of Dudley Freshwater from Eccleshall First Responders to talk about the vital work carried out by the volunteers. Jay Eames gave people an opportunity to ask questions about the realities of being a Responder, giving a unique insight into life in uniform and incidents he’s attended. 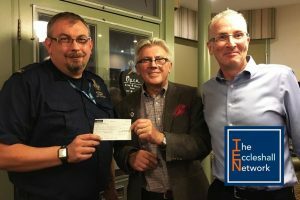 The event was organised by Tim Hulse of Eccleshall-based Accountancy and Business Advisory firm Piper Hulse and Tim took the opportunity to bring the event full circle by presenting the First Responders with a cheque for £180, generated by sales of tickets to the gathering. Ten’s ongoing philosophy will be to use an hour per month to unite local people and profits from the £10 entry fee will support yet more local good causes. Tim said: “I’m really pleased to see such a fantastic turnout from our local community and want to build on the success of the first Ten event by encouraging yet more Ecclians to come along to our monthly get-togethers. “I believe it’s important to support home-grown organisations, to develop that sense of belonging and to nurture the great things that come from a better-connected society. Presenting the First Responders with £180 is the icing on the cake.